This paper deals with an analytical framework to provide a measure of overall performance which involves both socioeconomic activities and environmental sustainability using a recent Index of well-being. The composite indicator, created by Medrano-B & Teixeira (2013), is associated with the so called “Magic Square”, a diagram stimulated by the work of Kaldor (1971). From this starting point, we introduce a set of four variables to measure their total impact on the sustainable development of regions. They are: human development index, per capita carbon dioxide, drinkable water and sanitation, and intensity of renewable energy measured as a fraction of the total generated energy. This formal approach is applied to the comparative performance of the USA and China from 2002 to 2012. As expected, environmental, socioeconomic and institutional indicators affect the level of welfare. This being the case, an important lesson to be learned is that careful regulation and policy actions, not just proposals, are required to implement a sustainable and acceptable quality of life. In this article we complete the argument by suggesting that a new paradigm is required to fulfill our desirable objectives, and get more out of our intellectual effort, capabilities and political influence. Given the current immense accumulation of negative effects on the environment, we wonder at the relative complacence worldwide with the impact of the present patterns of production and consumption. No longer is it only dreamers and visionaries who are alerting society to the deep and undesirable consequences affecting humanity as well as other species and future generations. It is actually interesting to observe the relative alienation, silence and apparent indifference of many people and governments in this matter. We need urgent action to change the present situation. However, we must recognize that actions and changes, without precise thought and clear goals, are counterproductive. In this vein, the major challenge for humanity is to develop a shared socioeconomic vision desirable to a vast majority of people and ecologically sustainable from a global perspective. This paper is the product of a research agenda the core of which is to design a modeling framework to measure the impact of a set of variables with a composite index of welfare constructed and computed from indicators of trends. The original insight is encountered in the work of Kaldor (1971), but he was only concerned with macroeconomic variables. He did not consider environmental issues nor did he introduce equations or numerical or graphical illustrations in his analysis. Here we extend his method to include aggregated indicators on socioeconomic performance and environmental and sustainable development. We stress that due to the efforts of Karl Schiller and economists of the OECD, an intuitive geometric diagram was established in the 1970s dealing with fundamental macroeconomic variables. This representation, called ‘Magic Square’, is associated with the size of the area of a figure conceived in such a way that its four directions (N, S, E, and W) are expressed in percentages. Medrano-B & Teixeira (2013) normalized the mentioned vectors to make them uniform. The area of the quadrangle was calculated due to the non-uniform scales of the axes. 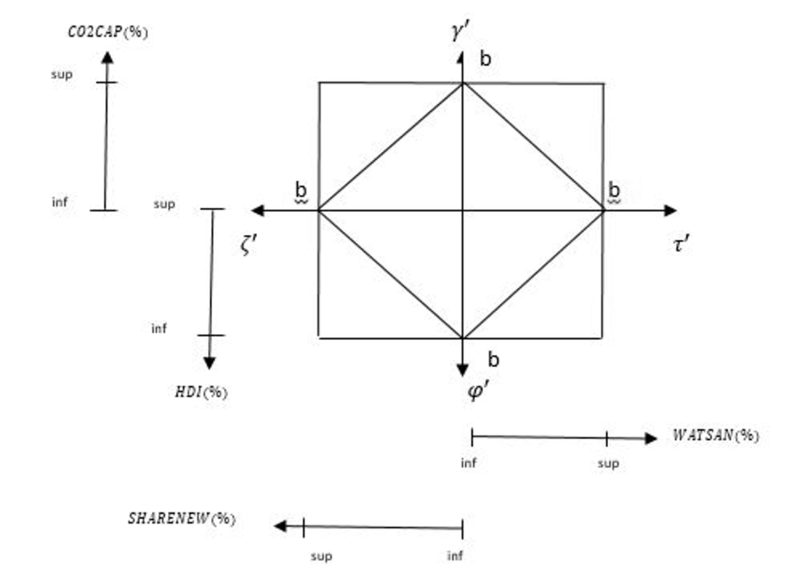 This produced an analytical transformation which allows the calculation of the area of the relevant quadrangle. The measure ends up as a composite index of welfare. Such an indicator captures the impact of the re-dimensioned components of the index. The new method was used by Firme & Teixeira (2014) focusing mainly on Brazil’s macroeconomic performance. The formal approach is expanded here in order to integrate a set of interconnected socioeconomic and ecological measures to produce a single welfare index. We believe that a collection of composite indices is necessary for measuring multi-dimensional characteristics which would be hard to explain using a single variable. This is certainly the case with sustainable development. The latter concept remains somewhat elusive since it may encompass a wide set of issues over different time periods, regions and theoretical visions. Under this complex circumstance there is a widely shared consensus that the ecosystem is a non-ergodic dynamic structure. Omitting to describe development in a holistic perspective and to measure its impact for meaningful comparative work is a pressing problem worldwide. Gasparatos, El-Haran & Horner (2007) argue against a reduced form approach for assessing sustainability of the ecological system. According to them, the use of a single metric to address the environment is a naïve approach to the serious threat confronting society. This is the main reason why we decided to examine the problem by combining a set of composite indicators integrating socioeconomic and ecological variables. Here, special emphasis is placed on the challenges confronted by states in transition. The present article focuses, simultaneously, on the relationships among four composite key variables: Human Development Index (HDI), Per Capita Carbon Dioxide (CO2CAP), Drinking Water & Sanitation (WATSAN), and Renewable Energy Intensity as a share of national (total) generation of energy (SHARENEW). We highlight the main reasons accounting for the fragility of the environment by clarifying the meaning of the above variables and their significance in the process of sustainable development. Our empirical analysis examines the comparative performance of the USA (an industrial country) and China (an emergent one). We are concerned with the conflicts between economic prosperity and welfare on the one hand, and its ensuing environmental problems on the other. Accordingly, the somewhat prevalent feeling of increasing welfare may well be deceptive and unsustainable. Therefore, solving the sustainability problems of development is required in order to reduce the major environmental threat to the present and future generations of society. Following this introduction, the paper is subdivided as follows: Section 1 centers attention on sustainability and sustainable development. Section 2 presents a composite formulation of a normalized index which measures both socioeconomic and environmental performance. Section 3 estimates socioeconomic and environmental trends for the USA and China at the beginning of this millennium (2002 to 2012). Section 4 presents some concluding thoughts, summarizes policies to promote sustainable development and highlights the main comparative conclusions about the two countries. It is well known, although frequently obscured, that conventional economic analysis takes for granted two twin assumptions: a) free endowments of natural resources, and b) free disposal of wastes. Accordingly, the environment is envisaged to be, simultaneously, “a horn of plenty and a bottomless sink”, as pointed out by Kurz & Salvadori (1997) in the introduction to their article. From the standard perspective of free competition, the environment is basically neglected. They argue: “production can be conceptualized as a process whose inputs are only labor and produced means of production. Thus, outputs are merely commodities”. Under these oversimplified conditions, it follows that the environment does not matter and the prices of exhaustible resources are not taken into account. From this standpoint they criticize such approaches and conclude that, despite the progress made in their own dynamic analytical framework, “many more steps will have to follow before one arrives at a moder­ately satisfactory theory of exhaustible resources”. Indeed, we do not have a complete dynamic model on sustainable development. Such a paradigm is unquestionably desirable for a proper analysis of environmental performance in a world surrounded by uncertainties. Unfortunately, most of mainstream economics literature dealing with the dynamics of the environment tends to obscure some essential points. Although market failures and externalities are mentioned, they are considered mainly and merely as exceptions. In the same vein, along with questionable propositions connecting living standards to simple productivity, the common position on efficient allocation of resources remains founded on self-interest and Pareto optimality and is inadequate for treating the complexity of the real world. Despite not being immediately recognized, the publication of The Limits to Growth in 1972 did mark the starting-point of an era of criticism of the unquestioned faith in the conventional analyses of the economics of environment. No doubt, an expanding network of persons, worried about the effects on both nature and humankind, started to work out some rethinking. New thought and actions led to increasing doubt and uncertainty about the sustainability of the dominant ecological and socioeconomic organization of society. Jacobs & Slaus (2013) summarize the vigorous debate between the orthodox (or standard) vision and the search for the key elements of an alternative paradigm. Naturally, a set of seed-ideas was required to highlight the reasons that may account for the fragility of the conventional theory of growth and accumulation of capital. To do so we need to clarify the meaning of “sustainable development” and “sustainability”. It is of interest to note that Solow (2012, p. 543), a neoclassical economist, pointed out: “The questions that come to be connected with sustainable development or sustainable growth or just sustainability are genuine and deeply felt and very complex”. Those concepts have been defined in many ways, but the most quoted one is from the Brundtland Report (1987), published by the “World Commission on Environment and Development” (WCED), with the title “Our Common Future”. It states that “Sustainable Development is development that meets the needs of the present without compromising the ability of future generations to meet their own needs” (p. 43). “Sustainability”, on the other hand, is currently defined as the practice of maintaining the process of productivity indefinitely—natural or manmade—by replacing resources used with resources of equal or greater value without degrading or endangering natural systems. In our understanding the above definitions contain two underlining views: a) the concept of need is actually concerned with essential needs of the world’s poor for which overriding priorities should be given; b) the idea of limitation involves serious considerations on the state of technology and social organization on the environment’s possibility in such a way that thought and actions should meet both the present and future needs. Surely, such double foundations require that the physical planet and society should be looked at as a system that connects space and time. These may well be considered important formulations, but they are methodologically problematic, as also emphasized by Solow in the same article, page 544: “If we try to look far ahead, as presumably we ought to if we are trying to obey the injunction to sustainability, we realize that the tastes, the preferences of future generations are something that we don’t know about. Nor do we know anything very much about the technology that will be available to people 100 years from now”. Despite the current difficulties, including the economic crisis started in 2007/08, the movement towards better socioeconomic and environmental performance produced some positive effects worldwide. For instance, one of the main outcomes at the United Nations (Rio+20) Conference held in Rio de Janeiro, Brazil, in June 2012, was the formulation of an agreement by member states to set targets for sustainable development—the future we desire. The objective sought to include the fundamental aspirations of both people and important institutions. Sustainability and the effort towards Global Footprint Network, it may be argued, are to a large degree a ‘fait accompli’. However, we need to be cautious in this matter. Nowadays, people worldwide are more aware of global climate changes. Alarm about the increasing planetary warming is in the daily press and such global concern does not constitute a novelty anymore. The Synthesis Report of the Intergovernmental Panel on Climate Change (IPCC), in November 2014, from Copenhagen, did spread some scary statistical data and projections on the matter. In the “Approved Summary for Policymakers” (p. 3) the report mentions: “Human influence on the climate system is clear, and recent anthropogenic emissions of greenhouse gases are the highest in history”. On the same page, it also mentions that: “Each of the last three decades has been successively warmer at Earth’s surface than any preceding decade since 1850”. Furthermore, as indicated in page 7, “Cumulative emissions of CO2 largely determine global mean surface warming by the late 21st century and beyond. Projections of greenhouse gas emissions vary over a whole range, depending on both socioeconomic development and climate policy”. In December 2014 a conference on climate, the COP20, took place in Lima, Peru. It was not a success, but kept open the possibility of some agreement in the forthcoming important meeting, the COP21, which will occur at the end of 2015 in Paris, France. It hopes to estab­lish a global accord on the subject—provided that nations will look beyond their navels and their own frontiers. No doubt, to address effectively the mitigation and adaptation of the present environmental condition, and to identify the path towards the desirable one, raise fundamental issues concerning equity, justice and fairness. They also face varying challenges and capabilities to finance the process of sustainable development. Most people point to the success of some affirmative actions towards sustainability. However, it may be argued that it is possible to attribute the declining resistance to sustainable development to guilt, indifference and the fear of being accused of old-fashioned or backward thinking. It is important to realize that there is a veiled rationality, sometimes disguised, that can’t be ignored. A strange paradox: Sustainable development is desirable but perhaps too costly for the investment projects of most entrepreneurs. Furthermore, it has an invisible enemy: almost no one is apparently against sustainability but the hardest task is to change deeply held attitudes. The deep understanding of the circumstances, past and present, as well as potential paths towards a desirable future, is not a simple matter. History, statistics, philosophy and values are all required in effective formulations to guide the decision makers. We know that to generate such models is a difficult task. For instance, the uncertainty or vulnerability of the variables involved, the creative and robust definition of each indicator being used, and the analysis of possible multiple correlations among them can make the comparative analysis of alternative paths quite complex. We intend here to outline a proposal for a composite index which can evaluate socioeconomic welfare defined to include environmental performance. As pointed out by Marien (2011, p. 139), “Green growth is not a replacement for sustainable development, but should be seen as a subset, in that it is narrower in scope”. Nagan & Arena (2014) propose what they consider to be the necessary elements of a new paradigm and seek to locate the new paradigm of political economy in terms of its global reach. We add that, to aspire to and accomplish such an aim we need to construct a vision which serves the planet consciously and not only use it for its own selfish needs, as we have been doing. In this vein, formal models with strong analytical features are desirable. The resulting empirical analyses, based on both the historical record and projections, may result in propositions for research on the transitions and dynamics of sustainable development. Our composite socioeconomic and environmental Index of Welfare is presented in the next section. We need an Index of Welfare which can measure both socioeconomic development and its sustainability. Such a metric should be designed to take into account the health of people of a region, nation or the world, of other species as well as the impact on the natural environment. We consider that the Gross Domestic Product (GDP) or the GDP per capita over time do not capture these features by themselves. Actually, Kuznets (1934), the inventor of the concept of GDP, indicated in his first report to the USA Department of Commerce, Senate document, that he disapproved the use of the GDP as a general indicator of welfare. He noted that “the welfare of a nation can scarcely be inferred from a measure of national income” (p. 7). Hicks (1946) also pointed out the practical difficulty of using GDP per capita as an objective indicator of a nation’s welfare. There are an increasing number of scholars and institutions working hard on the search for how to go beyond the Human Development Index (HDI). This is the case of initiatives by the European Union, Club of Rome, World Academy of Art & Science, OECD, etc. Surely, the relevant indices of welfare must take into account a wider context and changes in related spheres of human knowledge. To make the required progress in this direction involves visions, values and methods. New theoretical formulations and empirical data are important to capture the dynamics, complexities and sustainability of socioeconomic development. Fullerton & Stavins (2012, abstract, p. 3) argue that, “Economists themselves may have contributed to some misunderstandings about how they think about the environment, perhaps through enthusiasm for market solutions, perhaps by neglecting to make explicit all the necessary qualifications, and perhaps simply by the use of jargon”. We state specifically that the expansion of global output is not a reliable measure of development. This indicator may encourage a search for unbounded higher productivity and consumption. It may tend to overvalue unviable expectations of sustained higher levels over time. It obscures both current and potential ecological problems. It may somewhat stimulate the expansion of the economy but frequently degrades the environment and even the welfare of both humans as well as other species. There is an extensive set of models dealing with the relationship between socioeconomic variables and measures of their environmental effects. Most such models are goal-oriented as their authors take their ultimate purpose to be the search for practical ways of improving human welfare. As expected we are unable to build models which can include most of the immense number of indicators or variables that shape the interaction between human behavior, institutions and the environment. From a methodological stand point, we need to set up reasonable abstractions and simplifications of reality. Conceptually, we need to express in simplified forms a number of different alternative representations of a complex whole. In this sense, although one should search for a more encompassing perspective, no doubt, any specific model represents a particular viewpoint. Therefore, the relevant conclusions will be the result of an emphasis on the set of particular factors being considered. Nevertheless, a formal approach is crucial but can be viewed as no more than providing some building blocks for a representation of the complex nexus of reality. We will propose here a composite indicator of welfare which takes into account social, human and environmental criteria. We believe that our composite index provides insights into comparative development levels which most of the current indicators cannot. In this sense, our model provides a new alternative step to reach a desirable measure. It is not surprising that we have witnessed numerous attempts to construct composite indices intended either to replace or to complement both GDP per capita and HDI. Some critics argue that while generally held to be politically useful, such new indices have proved to be somewhat redundant in the sense that their values have been shown to exhibit a positive and statistically significant correlation with GDP per capita. It follows that these indices may have failed to encompass what GDP per capita cannot capture. As we mentioned in the introduction, a stimulating starting point to deal with the formulation of a model encompassing the interrelationship involved in the sustainability of development is a seminal article by Kaldor (1971), in which he considers the macroeconomics of the conflicts across national policy objectives. However, he does not deal with the environment. An extended enquiry led to the introduction by Karl Schiller, in the early 1970s, of a graphical representation of Kaldor’s original view. A glance at the resulting diagram reveals a diagnosis of comparative performance. This analytical instrument was called a “Magic Square” (MS) and soon after some economists from OECD began to use this geometric apparatus to evaluate economic policies. The “wonderland”, which was introduced by OECD, is an ideal configuration which takes into account desirable features of a system composed of a set of variables represented by the larger area of a quadrangle. It involves the calculation of norms or values postulated as idealized references for a given accounting period. To start the procedure, we need reliable information on the numerical values of the variables, and then to find the limits (bounding conditions), designated as “awful” and “desirable” for each. In the next section we will consider the meaning of the four variables involved in the performance of the USA and China. We will also include the relevant statistical data to be used as well as the construction and the result of the Index of Welfare (A’). According to Climate Analytics (2014), the USA and China are responsible for between 35% and 45% of the current world emissions of CO2. However, neither of these two countries is in the frontier of techniques to improve their respective patterns of energy efficiency. Of course, their joint effort would help considerably to prevent threatening climate change, if they decide to limit the current use of conventional energy and apply an enhanced effort towards a policy of sustainable development. In both countries there is evidence of concern for finding sustainable ways to produce and consume energy. Despite this concern, however, the results have been insufficient to make a major impact on the continuing undesirable transformations of the environment. In the last few decades, China has taken a big jump in its rate of economic growth. Nowadays, its GNP is about half of the USA while the average per capita consumption of electricity of USA is four times China’s. In the last 10 years, the annual growth rate of GNP of China was 10.5% compared to USA’s 1.6%. Most of it is produced in these economies by burning fossil fuel. In neither is there an important economic sector leading the world in the effort to substitute these fuels for those which can mitigate the effects on climate change. The energy consumption of the industrial sector in China is increasing significantly and recently the national government took some steps in the direction of the use of sustainable energy, but neither China nor the USA is adopting the more environmentally friendly standards of the European Union in this matter. For an illuminating view on the needed institutions and policies, see Costanza et al (2015), which presents a well-worth outlining on this matter. The October issue of “Climate Analytics” (2014) indicates that, if China and the USA were to adopt, together, the most ambitious policies of efficiency used by the European Union, it would be possible by 2030 to reduce the emissions of CO2 to 10% below the current policy projection of “Climate Action Tracker”. This may well be a reasonable justification for why we decided to compare here the socioeconomic and environmental performance of these two countries, taking as a theoretical indicator the composite Index of Welfare presented in the previous section. The results of the present enquiry are somewhat preliminary. They can be considered more of an illustration. We should also mention that our approach does not take into consideration that the relationship between environmental sustainability and sustainable development is to a large extent a function of long term trajectories, and that our time series of statistical data is not long enough. We contend that such long series is not available. To some extent however, it may be justified to try to draw conclusions from the data available even though they are not a totally satisfactory sample. As an application of the complete set of variables for USA and China, we will use the four variables already defined. To help the exposition, the variables and their extended definitions are shown in Table 1. In order to calculate the composite index of Welfare, we use the period 2002 to 2012. It is worth mentioning that the limits (bounding conditions) we use are based to a large extent on the maximum and minimum values of the four variables CO2CAP (ϒ), WATSAN (τ), HDI (ϕ) and SHARENEW (ζ). They are expressed in percentage changes on the four axes, as indicated in table 2. The meaning of the CO2CAP has been already explained above. Here, we consider CO2 only as a proxy for greenhouse gases (effects) which penetrate the atmosphere, absorbing and emitting radiation. Anthropogenic CO2 emissions come from combustion of carbon-based fuels (primarily wood, coal, oil and natural gas). Since the beginning of the industrial revolution, the burning of fossil fuels and extensive devastation of native forests has contributed to a 40% increase in the atmospheric concentration of CO2. The temperature in the planet has gone up 0.8° Celsius since 1880, on average. Furthermore, there is an acceleration of global warming since World War II. This process, if not contained, will drive the planet to a catastrophe. Concerning WATSAN (τ), its welfare implications are quite obvious. To gain access to improved drinking water and sanitation is a vital step towards improving health and well-being. Despite the progress worldwide, the planet remains off-track concerning both targets, for safe water and for sanitation. The economic gains from provision of improved services of drinking water and sanitation must comply with international standards. The adoption of the Millennium Development Goals demonstrated the inadequacies of provision of these services which were carefully examined in the document. They are important with respect to their ecol­ogical, economic and social functions, and also provide important benefits to the ecosystem. There is no need to emphasize here the importance of the Human Development Index (HDI). However, we should take into consideration that in the 2010 Report a further Inequality-adjusted Human Development Index (IHDI) was introduced. Income distribution and concentration are important indicators of the real wealth of nations. The well documented book by Thomas Piketty (2014) shows that inequality is currently rising in developed countries. He also comments extensively on its harmful effects. In the present article the simple HDI is used. We still do not have a long enough statistical series for an examination of the relevant impact of socioeconomic policies for changing the income distribution on the pathways to human development. For reference, see the United Nations Development Programme’s Human Development Report, released in July 2014. We explain now the SHARENEW indicator. Energy is a vital element in human life and to secure a sufficient and accessible supply is crucial for sustainability in contemporary societies. The demand for energy is increasing rapidly and the trend is likely to continue. Renewable energy—solar, wind, geothermal, modern biomass and hydroelectric—requires appropriate policies and new technologies. Fossil fuels in their crude form, such as wood, coal and oil, have traditionally been used as energy resources extensively. Society has been acknowledging that, although they dominate the market, they present high levels of pollutants, and that a significant effort must be made to reduce their presence in the structure of the planet’s economies. This is the reason why we introduce the variable, demand for renewable energy divided by the total expenditures on energy. Now that the four indicators are described above, it is time to deal with the calculation of the composite index. Naturally, the usefulness of the ideal bounding (wonderland) configuration requires the establishment of suitable numerical values for the four variables. Then, we need to establish the two limits, “awful” and “desirable”, for each. Here we introduce statistical data for China and the USA. We estimate the average values for the years 2002/2003 and 2011/2012 in order to compare the changes in the two countries which occurred over the interval of ten years. Such averages of the two years, for the initial and terminal periods, tend to reduce the weight of any peculiarities of an atypical year. The results are shown in Table 2. Table 3 shows the calculated superior (sup) and inferior (inf) limits given by expressions (1) and (2) as well as the Desirableland‡ configuration. The perceptions and dimensions of global climate change may, in the long run, prove to be the most significant task in terms of both its potential damages and its cost. We will restrict the discussion to what we view as being the most salient points. Unfortunately, the empirical evidence to date has not provided overwhelming support for any configuration of the Wonderland parameters. However, from historical circumstances, we are able to represent a kind of normative limits, the bounding conditions as explained previously. To proceed, consider first CO2CAP. We want to encounter the extreme points (awful and desirable) of the interval corresponding to that variable. In order to determine the lower limit (awful), we just take the average between the observed lower limits on both countries. Notice that this average is taken under the assumption that the worst performance between the two countries gets weight equal to 2/3 and the best one equal to 1/3. We determine the upper limit (desirable) in a similar fashion, but we inverse the weights. In other words, we consider 2/3 for the best and 1/3 for the other. Observe that these weights were obtained through the method of “convergence of opinions in group”—graph algorithm.§ Such weights indicate that the former has a superior performance and the latter, an inferior one. We consider the upper limit (desirable) in a similar fashion. We proceed likewise for the remaining three variables. Source: The authors' own elaboration from information in Table 2. Since the numerical value of b has been already defined (square root of 2 divided by 2), we will substitute this value in expression (4). This leads us to the transformations required to obtain the corresponding numerical values of the four original variables given by the Greek symbols. That is, the primed ones given by the set of expressions (7). 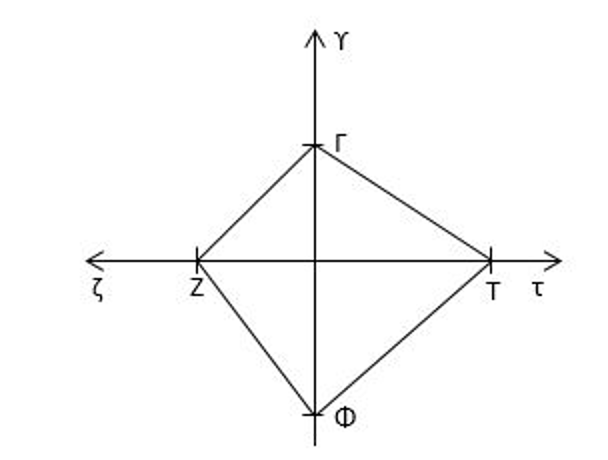 As an example, we will take the transformations of ϒ and then ϕ. The area of the square (Desirableland), corresponding to the figure 2 is equal to 1. Now, we calculate the representative areas for the USA and China, given by expression (6). Now, in Figure 3 and 4, we can visualize the results obtained through Kaldor’s Magic Square. In table 4, we note that China obtained results more impressive than the USA in majority of the variables. 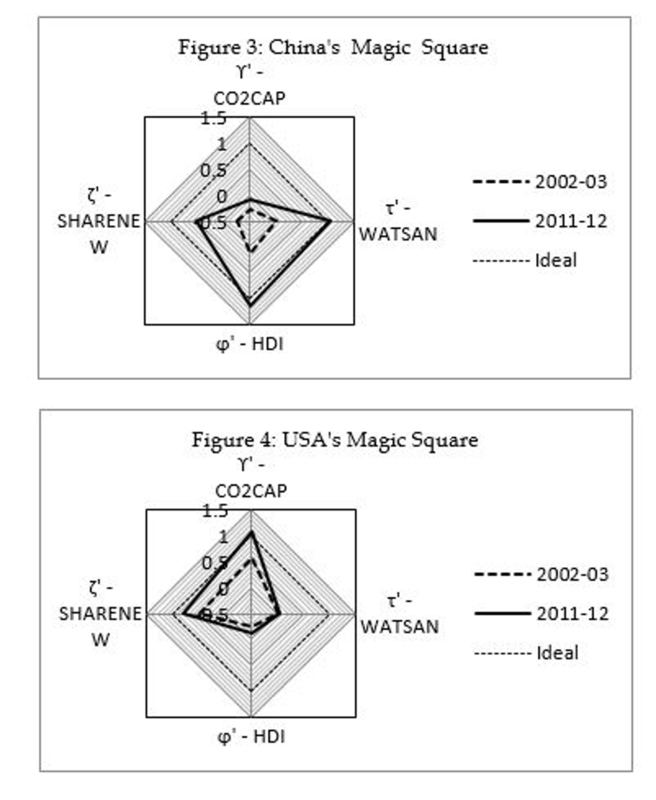 Analyzing HDI and WATSAN, the Asian country has performed very well ( ϕ’=0,100; τ’=0,104), which is a considerable leap forward in the social area. In compliance with the United Nations Development Program (UNDP), this social improvement occurred due to the significant economic growth that was achieved, especially, the income per capita. Moreover, it appears that governmental support and political willingness became the main driving force to improve the water and sanitation services. The USA also had a good performance in these indicators ( ϕ’= 0,012; τ’= 0,005). Since 2002, the USA has shown improvements in all areas including the HDI. Furthermore, it has one of the best systems of basic sanitation in the planet. According to the World Bank, almost all citizens have access to treated drinking water and piped sewage. In relation to SHARENEW, China ( ζ’= 0,078) and the USA ( ζ’= 0,029) made only little progress in ten years. The Chinese environmental commitment is based on geopolitical and other factors. The country became a major consumer of petroleum. Consequently, the dependency on imported fossil fuels has increased, which is always a risk in the context of an emergent country. Moreover, the consumption of oil and, especially, coal has been creating negative consequences domestically. The number of cases of respiratory diseases in China’s big cities has been growing exponentially because of the air pollution caused by the burning of coal. To solve these problems, the government is investing substantially in renewable sources of energy. This reality is captured in China’s result for CO2CAP ( ϒ’= 0,019). On the other hand, the USA reduced their C02 emissions significantly in the last ten years, which can be observed in the CO2CAP result ( ϒ’= 0,051). According to the U.S. Energy Information Administration (EIA), the country recently started the transition to a low-carbon economy. One example of the new measures put into place by the government was the switch from coal to natural gas in energy production. In this paper, we have proposed and made use of a composite indicator of welfare which takes into account social, human and environmental sustainability. Our composite indicator provides insights into the development patterns of any given region. Such comparisons are welcome as attempts to quantify patterns which can allow us to rethink the notions of growth, distribution and ecosystem performance in the different countries. Here we concentrated our effort in the comparison between only the USA and China. We took as reference period the years 2002-2012 and four composite key variables: Human Development Index (HDI), Per Capita Carbon Dioxide (CO2CAP), Drinkable Water and Sanitation (WATSAN), and Renewable Energy as a share of total energy use (SHARENEW). We conclude that although the level of welfare and degree of sustainability is much higher in the USA in comparison with China, the comparative welfare performance of the latter, in the period studied, is much higher than in the USA. It means that China has been exerting a stronger effort than the USA in this direction. It happens that we are not sure that such effort is sustainable. It is unreasonable to be anticipatory and prescient about the future, but the dominant economic paradigm may lead to major challenges. We need a new economic paradigm involving new visions and solutions which have to be implemented. It is necessary to understand that the fundamental problems all living species face are very severe. It is not just an economic question of increasing efficiency (productivity) in order to guarantee growth, distribution and accumulation of capital. The new paradigm requires the much larger dimension of the socioeconomic process and its sustainability. As pointed out by Joan Robinson (1977, p. 1337), “These questions involve the whole political and social system of the capitalist world; they cannot be decided by economic theory, but it would be decent, at least, if economists admitted that they do not have an answer to them”. Naturally, the transition towards a new paradigm involves an international movement which integrates the natural and social sciences in order to address the prerequisites for sustainable development. This movement requires synergy and action through interconnections across research centers at an international level. This deep cooperation is necessary to improve the data and quality of research on topics such as low carbon transitions, global warming, environment, ecosystem services and their accompanying socioeconomic policies. The basic problem is: in any complex chain of events, there is a fundamental asymmetry between the present (status quo) and the future. During the transition, each element of the chain may break down when it encounters an almost infinite set of uncertainties. When this happens, the narrative may become unpleasant and the prospective path to be followed doubtful. This may allow people and their governments to conclude, erroneously, that it is better to hold on to the current ways. However, this is a naive perception. Actually, creating the shared vision of a new paradigm of a sustainable and desirable material future, is perhaps the fundamental task facing humanity today. The previous paragraph may give some readers the false impression that nothing really important can be attained by a single individual dealing with the difficult problems posed by the theme of our enquiry. It is true that group research presents great advantages. However, it may be useful to recall the first paragraph of Hahn (1989. P. 13): “those individuals who are endowed with a special genius for the subject and have a powerful economic intuition will often be more right in their conclusions and implicit presumptions than in their explanation and explicit statements. That is to say, their intuitions will be in advance of their analysis and their terminology. Great respect, therefore, is due to their general scheme of thought, and it is a poor thing to pester their memories with criticism which is really verbal”. [J.M. Keynes (1924) quoted by Hahn in Kaldor (1972. p. 1249, n. 1)]. "We need a new paradigm of sustainable development, but to improve the possibility to attain success in the implementation of new visions and policies, we must be capable of measuring, analyzing and hedging the relevant variables which can help to improve the commitment of the relevant institutions." Environmentalism is a social and political tendency that is concerned about the conservation, improvement and sustainability of the ecosystem. This movement has now become worldwide and it is no wonder that scholars, national and international institutions are catching the “green fever”, and especially the issue of how to circumvent the global warming trap. The impulses for “going green” are now multiplying faster than was expected a few years ago. However, without a solid socioeconomic foundation, the green movement will scare people and governments. We need a new paradigm of sustainable development, but to improve the possibility to attain success in the implementation of new visions and policies, we must be capable of measuring, analyzing and hedging the relevant variables which can help to improve the commitment of the relevant institutions. Otherwise, a number of risks will be faced by society when new programs of sustainability are implemented. Bernard, Michel; Drouet, Michel; Echaudemaison, Claude & Pinet, Nicole. (1988). “Economie et Societé Fraçaise”. Editions Nathan. Paris, France. Brundtland, Gro. (1987). “Report published by the “World Commission on Environment and Development” (WCED). The Organization Center for “Our Common Future”. United Nations. Washington, USA. Costanza, Robert et al (2015). “An Introduction of Ecological Economics” (Second Edition). Boca Raton FL: CRC Press (Taylor & Francis Group). Dalkey, Norman & Helmer, Olaf (1963). “An Experimental Application of the Delphi Method to the Use of Experts”. Management Science, Vol. 9, Issue 3, pp. 458-467. Firme, Vinícius & Teixeira, Joanilio. (2014). “ Index of Macroeconomic Performance for a Subset of Countries: A Kaldorian Analysis from the Magic Square Approach Focusing on Brazilian Economy in the Period 1997–2012. Panoeconomicus, Vol. 5, Special Issue. Fullerton, Don & Stavins, Robert. (2012). “How Economists See the Environment”. Chapter 1 in “Economics of the Environment”. Selected Readings. Edited by R. Stavins. 6th Edition. W. W. Norton & Company, Inc. New York, USA. Gasparatos, Alexandros & El-Haram, Mohamed & Choi, Hyung-Jin. (2011). “International Conference on Whole Life Urban Sustainability and its Assessment”. Edited by M. Horner & C. Hardcastle & A. Price and J. Bebbington . Glasgow, Scotland. Giarini, Orio. (2013). “The Club of Rome and the Limits to Growth”. Chapter 5 in the book published by O. Giarini. “Itinerary to the Third Age”. The Risk Institute. Special Edition. European Papers on the New Welfare. No. 18. Trieste, Italy. Hahn, Frank. (1989). “Kaldor on Growth”. Cambridge Journal of Economics, Vol. 13, pp. 47-57. Hicks, John. (1946). “ Value and Capital”. Second Edition. Claredon Press. London, UK. Human Development Report 2014. (2014). “Sustaining Human Progress: Reducing Vulnerabilities and Building Resilience”. China- HDI values and rank changed in the 2014 Human Development Report. United Nations. IPCC, Fifth Assessment Synthesis Report. (2014). “Climate Change 2014”. Approved Summary for Policymakers. United Nations. Washington-DC, USA. Jacobs, Garry & Slaus, Ivo. (2013). “From Limits to Growth to Limitless Growth”. In the Introduction to “Itinerary to the Third Age”. Published by O. Giarini. The Risk Institute. Special Edition. European Papers on the New Welfare. No. 18. Trieste, Italy. Johnson, Ian. (2011). “The Perfect Storm: Economics, Finance and Socio-Ecology”. A Commentary. Cadmus. Vol. I. No. 2. April. Kaldor, Nicholas. (1971). “Conflicts in National Economic Objectives”. The Economic Journal. Vol. 81 (321). Kaldor, Nicholas. (1972). “The Irrelevance of Equilibrium Economics”. Economic Journal, No. 328, pp. 1237-1255. Klugman, Jeni & Rodrigues, Francisco and Choi, Hyung-Jin. (2011). “The HDI 2011: New Controversies, Old Critiques”. Human Development Research Paper 2011/01. United Nations Development Programmes, Human Development Reports. April. Washington-DC, USA. Kurz, Heinz & Salvadori, Neri. (1997). “Exaustible Resources in a Dynamic Input-Output Model with Classical Features”. Economic Systems Research. Vol. 9. Kuznets, Simon. (1934). “National Income, 1929–1932”. 73rd US Congress. 2nd session. Senate Document No. 124, page 7. Washington-DC, USA. Marien, Michael. (2011). “Towards Green Growth”. Review of OECD book with the same title . Cadmus. Vol. 1. Issue 3. October. Medrano-B, René & Teixeira, Joanilio. (2013). “A Kaldorian Macroeconomic Index of Economic Welfare”. Revista de História Econômica & Economia Regional. Vol. 8. No. 14. Jan-Jun. Nagan, Winston & Arena, Valeen. (2014). “Towards a Global Comprehensive Context-driven and Decision-focused Theory and Method for a New Political Economy”. Cadmus. Vol. 2. Issue 2. May. Nordhaus, William. (2007). “Critical Assumptions in the Stern Review on Climate Change”. Science 317. No. 5835, pp. 2001-2002. Piketty, Thomas. (2014). “Capital in the Twenty-First Century”. Belknap Press. Cambridge, MA. Robinson, Joan. (1977). “What are the Questions?”. Journal of Economic Literature. Vol. 15, No. 4, pp. 1318-1339. Solow, Robert. (2012). “Sustainability: An Economist’s Perspective”. In “Economics of the Environment”. Edited by R. Stavins. Selected Readings. Sixty Edition. W. Norton & Company. New York, USA. Stern, Nicholas. (2007). “The Economics of the Climate Change: The Stern Review”. Cambridge University Press. Cambridge, UK. *This research article is part of the research program of the group of “Growth and Distribution” from the National Council of Science and Technology (CNPq-Brazil). For comments, contact: joanilioteixeira@hotmail.com. We thank Rodrigo Peñaloza, René Medrano-B, Michael Marien, Wellington Carlos and Ricardo Pasini for helpful suggestions. Any errors or omissions are, of course, the responsibility of the authors. † Notice that, the USA and China, after a long period of almost secret negotiations, announced, in November 2014, in Beijing, an unprecedented compromise towards the reduction of pollutant gases in an effort to conclude a global agreement on climate change in 2015. However, there is a strong domestic tendency in both countries to postpone such objectives. Anyway, it’s better to be pessimistic in this matter, since the result of the agreement will possibly be valid only after 2030 in China and 2025 in the USA. ‡ Notice that in the configuration of the empirical data, we changed the expression Wonderland to Desirableland, due to the fact that the first is an ideal vision and the second is only concerned with the potential performance in given historical circumstances. § This technique is related to the Delphi approach, mainly developed by Dalkey & Helmer (1963), for achieving convergence of opinions concerning real-world knowledge solicited from experts. This led to a mathematical structure—the graph theory.